Is KeyCorp (NYSE:KEY) going to take off soon? Prominent investors are becoming less hopeful. The number of bullish hedge fund bets were trimmed by 8 lately. Our calculations also showed that KEY isn’t among the 30 most popular stocks among hedge funds. 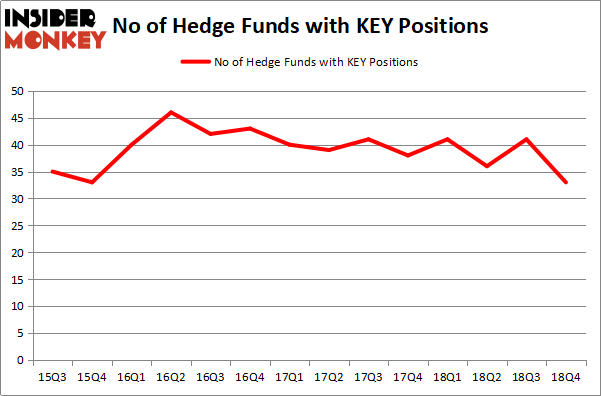 KEY was in 33 hedge funds’ portfolios at the end of December. There were 41 hedge funds in our database with KEY positions at the end of the previous quarter. We’re going to analyze the fresh hedge fund action surrounding KeyCorp (NYSE:KEY). What does the smart money think about KeyCorp (NYSE:KEY)? At the end of the fourth quarter, a total of 33 of the hedge funds tracked by Insider Monkey were long this stock, a change of -20% from one quarter earlier. The graph below displays the number of hedge funds with bullish position in KEY over the last 14 quarters. With the smart money’s capital changing hands, there exists an “upper tier” of noteworthy hedge fund managers who were upping their stakes meaningfully (or already accumulated large positions). The largest stake in KeyCorp (NYSE:KEY) was held by Pzena Investment Management, which reported holding $104.2 million worth of stock at the end of September. It was followed by Millennium Management with a $91 million position. Other investors bullish on the company included Arrowstreet Capital, Basswood Capital, and Adage Capital Management. Due to the fact that KeyCorp (NYSE:KEY) has faced falling interest from the smart money, we can see that there exists a select few funds that slashed their full holdings heading into Q3. At the top of the heap, Ken Griffin’s Citadel Investment Group cut the biggest stake of the “upper crust” of funds tracked by Insider Monkey, worth about $75.7 million in stock. Brandon Haley’s fund, Holocene Advisors, also dropped its stock, about $36 million worth. These bearish behaviors are interesting, as total hedge fund interest dropped by 8 funds heading into Q3. Let’s now take a look at hedge fund activity in other stocks similar to KeyCorp (NYSE:KEY). We will take a look at IAC/InterActiveCorp (NASDAQ:IAC), CGI Inc. (NYSE:GIB), Diamondback Energy Inc (NASDAQ:FANG), and Cheniere Energy, Inc. (NYSEAMEX:LNG). This group of stocks’ market values are similar to KEY’s market value. As you can see these stocks had an average of 39.25 hedge funds with bullish positions and the average amount invested in these stocks was $2357 million. That figure was $383 million in KEY’s case. IAC/InterActiveCorp (NASDAQ:IAC) is the most popular stock in this table. On the other hand CGI Inc. (NYSE:GIB) is the least popular one with only 17 bullish hedge fund positions. KeyCorp (NYSE:KEY) is not the least popular stock in this group but hedge fund interest is still below average. This is a slightly negative signal and we’d rather spend our time researching stocks that hedge funds are piling on. Our calculations showed that top 15 most popular stocks among hedge funds returned 19.7% through March 15th and outperformed the S&P 500 ETF (SPY) by 6.6 percentage points. Hedge funds were also right about betting on KEY, though not to the same extent, as the stock returned 18.7% and outperformed the market as well. Hedge Funds Have Never Been This Bullish On Weyerhaeuser Co. (WY) Do Hedge Funds Love Smith & Nephew plc (SNN)? 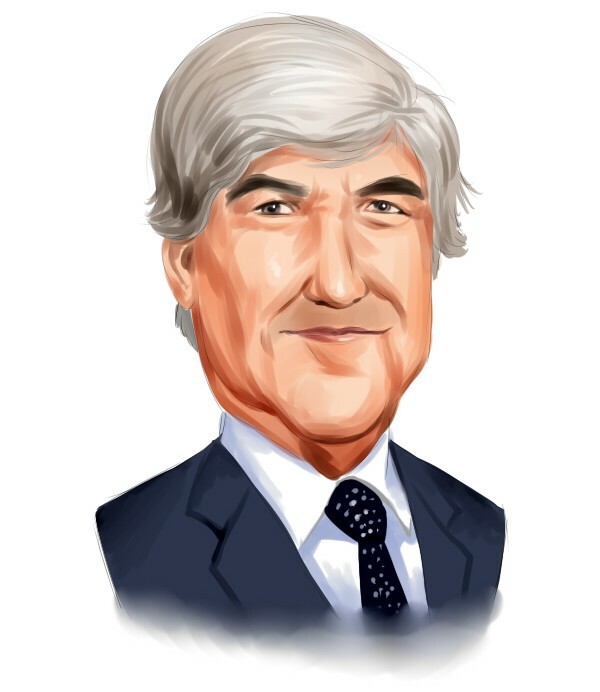 Hedge Funds Have Never Been This Bullish On International Paper Company (IP... Here is What Hedge Funds Think About Check Point Software Technologies Here is What Hedge Funds Think About CBS Corporation Do Hedge Funds Love CenturyLink, Inc. (NYSE:CTL)?